...... the click of a button. Automatically enters the Artist, Title and all track information and track times, credits, artist URL links, cover art - with just the click of a button - no typing. Saves hours of your time! Can also be used to enter CDs. * Scans all data tables on startup and automatically fixes any data errors that it finds. * Contains data sections with fields to enter and search classical music information: Composer, Piece, Orchestra, Conductor, Soloist, etc. Can associate an unlimited number of these to any and every CD/record. * It comes packaged with MP3 Catalogue Master - a utility to help you track and play your MP3 files. * All the information entered into Music Catalogue Master can be searched, filtered and sorted - display anything in the database. * Comes with over 275 pre-formatted reports that you can print out. Reports can be filtered to display only the data you want to print. 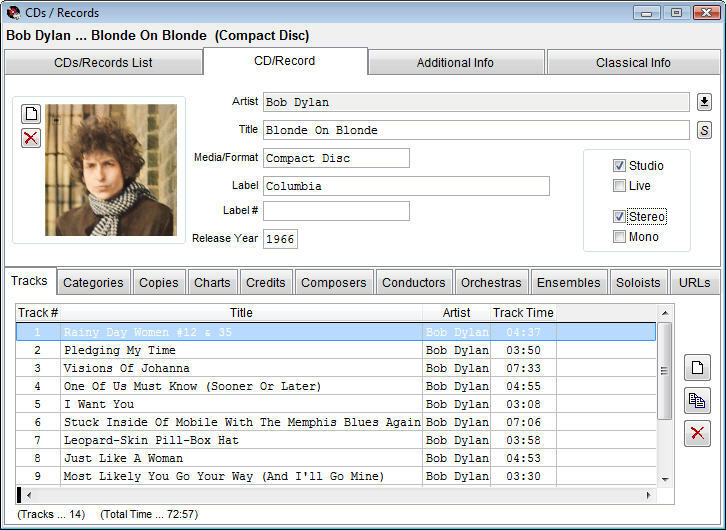 Organize your music collection in one complete user friendly solution. MCataloguer is so powerful that helps you manage all your multimedia files. Music Master is a highly performance tool for you to manage you music files. Qweas is providing links to Music Catalogue Master 5 2012 as a courtesy, and makes no representations regarding Music Catalogue Master or any other applications or any information related thereto. Any questions, complaints or claims regarding this application Music Catalogue Master 5 2012 must be directed to the appropriate software vendor. You may click the publisher link of Music Catalogue Master on the top of this page to get more details about the vendor.